I love my Bourjois Rouge Edition Velvet it just hugged on my lips and refuse to leave… so lasting, pigmented and creamy. Recently I added a few more Bourjois products in my makeup pouch, the Bourjois Silk Edition Compact Powder. Have you tried Bourjois? If yes what is your favourite Bourjois product? Compact powder is something that I surely have in my handbag, due to hot and humid weather of course I need to standby and touch up especially my t-zone. 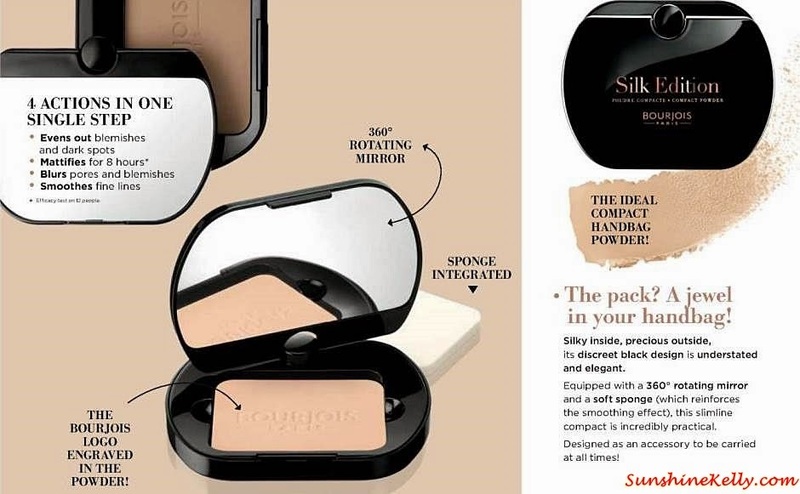 Bourjois Silk Edition Compact Powder is a jewel in my handbag, it comes in a very unique black slim and sleek casing equipped with 360 degree rotating mirror and a soft sponge that enhances the smoothing effect. So what is so great about this Silk Edition Compact Powder besides the cool looking packaging? If you have tried the textures then you know… I like the fine and smooth texture, when applied on skin it blends in well providing a soft silk finishing. It gives a natural look, the coverage is moderate however it can smoothen fine lines and blur out the imperfection such as pigmentations, blemishes and pores. Thanks to the matte formulation that can last for 8 hours. Overall, the effect and delivery are satisfying for this reasonable pricing compact powder. It is great for daily usage and to have one in your handbag. Oh ya forgot to inform you that Bourjois Silk Edition Compact Powder has 4 shades to match your skin tone #52 Vannille, #53 Beige Dore #54 Beige Rose #55 Miel Dore. Promotion: Introduction price is RM 49.80 at Bourjois Kiosk and Watsons from 27th January to 4th March, 2015. Availability: Bourjois products are currently available at selected Watsons stores in Klang Valley with a standalone kiosk located at Sunway Pyramid. me too, is in love with the Rouge Edition Velvet.. Ah~ other than that, I've tried the Healthy Mix Foundation, which makes my skin look even more dewy than usual... and of course the Healthy Balance powder which hit pan already so yes I definitely gonna check this out soon!